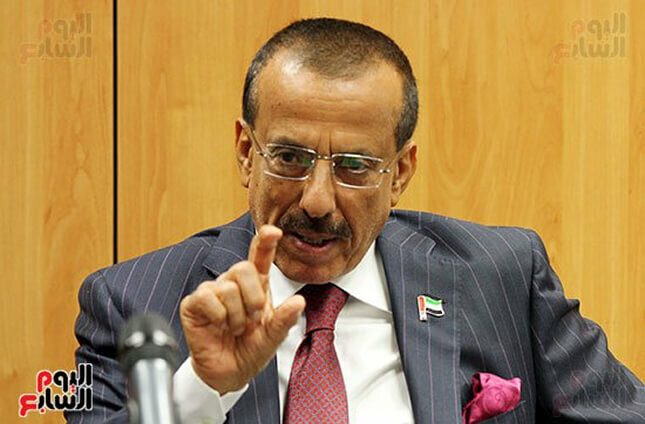 Khalaf Al Habtoor is a self-made man, who started his business from scratch to become one of the most renowned businessmen in the world… The Chairman of Al Habtoor Group (AHG), runs one of the most influential companies in the Gulf region,and has more than 30 international awards to his name. How did your journey bring you so far to become head of the empire you run today, and what is your message to the young people in Egypt and the Arab world? I have recounted my journey in my book (Khalaf Ahmad Al Habtoor – The Autobiography); it is a long story which is getting interest from the US, UK and UAE to turn my life story into a film. I grew up in a small family… As a child, I didn’t sit or play with other children, instead I used to accompany my father wherever he went because he loved me so much… He taught me camel riding, hunting and swimming. He taught me more than he taught my brothers. He taught me all the important things in life, and he always took me to the Majlis - full of adults, where he would ask me to learn the models of successful people… When I was 14 I applied for a job over the summer holiday to work as a translator for a French company. However, I failed. Next I worked with an Englishman in the geological photography company. One day, he gave me water and a broom and asked me to clean the place. I got angry because I didn’t think that it was my job to do such a menial task. So he asked me to sit down and he started to do the task himself. It had a big impact on me. I asked myself ‘Is it possible that my boss is doing this?’. In haste I took the broom from him and did as I was asked. He told me, ‘You Arabs consider it shameful to do such jobs, but English people think differently’. Since that day, I realized that work is not shameful no matter how menial the task may seem. On the contrary, working hard with dignity to support ones family is a great achievement. These were my first lessons in life. A big transformation has taken place post June 30. What is your assessment of the situation in Egypt? How do you see Egypt before and after June 30? People are not infallible. In the Gulf states we had respect for former President Hosni Mubarak and now we respect President Fattah el-Sisi. However, we didn’t know whether the administration was doing things the right or wrong way because we are far from the situation, and because we see things from the outsiders’ point of view. Revolutions have big impact on a country, and recovery requires a lot of time. However, if there is determination, I think it is possible to recover sooner provided decisions are taken quickly. I don’t want to talk about the past or the present, but taking tough decisions is one of the most difficult things in life. Only real men take decisions. What happened on June 30 was a decision taken by the Egyptian people and youth. If you were asked to invest in Egypt during the Muslim Brotherhood rule, would you have accepted? At the beginning of the year, you made an announcement about an $8bn investment and said you were waiting for the Egyptian government to reply. Have you backtracked on this or are you focusing on other investments instead? No, I haven’t backtracked. I submitted my offer to the state and explained my intentions to the relevant authorities. In your opinion, what is the best recipe for investment in Egypt given that you have achieved great success in other projects around the world? I have laid down stable and permanent foundations to help revive the economy. Some countries don’t have the funds, but this doesn’t mean that they cannot attract funds. I always say that the infrastructure is the basis to help any economy recover. The citizens should be encouraged to work. Lessons should be learnt from successful countries. It is not a shame to learn lessons from a younger person or a more modern country. By infrastructure I do not mean roads or bridges, but much more than that. It is the mobilization of the nation and its people such as ports, airports, universities and railways. These facilities should be built even if there is no need for them, in order to create jobs for the people. This is so important. Is it acceptable that Egypt imports 85 per cent of wheat when God blessed it with fertile land and the Great Nile? I cannot believe this! The state should ensure that the farmers are able to cultivate their lands and provide for their own people. This is imperative. Furthermore, tourism must be encouraged because it is a very important sector in all countries. Even the most developed countries in the world spend billions to attract tourists because this is beneficial to the country as a whole. This includes visas, and ease of travel, and not interrogation upon arrival in a country. When I visit New York, I feel that I am at home; as soon as I get off the plane a car picks me up and takes me to my hotel. It is so welcoming. This is so important for a great country like Egypt too; a country of history and ancient civilization. Another thing to mention is that Britain has sold some key and historic buildings, including Heathrow airport, and the headquarters of the Ministry of Defence that was been the command center in WWII. I have stayed in the building, which has since been turned into a hotel. It sold part of history and is benefiting from it. Meanwhile, in Egypt, the government refuses to sell hotels or historic buildings saying they are part of the Egyptian history. But why not sell them to get much-needed funds? How do you assess the performance of the Egyptian leadership and its government departments? Each party has its own competence. From my point of view, the government should stop interfering in all fields, especially where it is in competition with the Egyptian citizens. The government should sell hotels and other buildings to public joint-stock companies. The state should privatize the cement and iron factories and assist in production. The concept of the state regulating everything is not working. We are proud of the UAE and its success as an Arab country. The UAE leaders work with us as partners of success; they work with the citizens, residents and visitors, whether they Arabs, Muslims, Christians, or Hindus. We always say that we care about the visitors and the residents because we are all in the same boat. If the government were to stifle this, then it would take us back thousands of years. Did you discuss your idea to invest in hotels with the government? We met with the Chairman of the Hotels Board and she is considering it. However, there was reluctance my one attendee of the meeting who voiced concern that some buildings should be retained as they are an important part of Egypt’s history. We are ready to bring in international companies to conduct feasibility studies to assess the hotels, and to engage Egyptian investors. I suggested that commercial dealerships such as car dealerships should be owned by Egyptians. As an Arab from Gulf States, I have no right to own a land or building or anything at all. How do you see the investment opportunities in Egypt? Foreign investments require clarity from the state. I have met President el-Sisi, and I respect, appreciate and admire him. I was very honest with him, and told him that in our country, we sit with the head of the state to discuss issues no matter how small or big. We give our opinion and consult with them. I asked President el-Sisi if people are allowed to express their views in Egypt, he said, ‘Of course’. And given my love for Egypt, I couldn’t not talk about Saleh Salam Street… I call it the Oxford Street of Egypt and consider it even more important than the one in London. The street is empty when it should be packed with people. I told him I could turn it into one of the most beautiful streets in the world, and make it even better and busier than Oxford Street. I said this because I cherish Egypt... I am not dictating about what should be bought and sold, but simply giving my advice for the benefit of Egypt. I believe it would reap huge profits if the investment is allowed. Right now Egypt is not taking advantage of this street. It could be one of the prettiest streets in the world provided it gets the attention it deserves, and I don’t know why the government is not taking the necessary steps. What are, in your opinion, the obstacles faced by any foreign or Arab investor who would like to enter the Egyptian market? I met with the minister of investment, Dalia Khorschid, and got reassurances from her. I also talked to President el-Sisi who said that all the necessary procedures can be finalized quickly; but the issue is not the licenses; it is the red tape with the state departments at a later stage. I cannot bother the President at every hurdle. It is not my job to go the government departments or the ministers. I am an investor. In the UAE, the ministers understand. They visit us in our offices because they know are partners in success. Egypt would benefit from doing the same. What sectors do you believe need more investment in Egypt? The most important thing is to create jobs for the Egyptian people and the only way to achieve this is by improving the infrastructure. Not just the streets and roads, but also power stations, universities, hospitals, airports and ports. This is crucial for a successful economy. Let’s talk about the Gulf region… The UAE economy is one of the most vibrant and diversified economies in the region, with many of its Gulf neighbours still relying on oil. Given the decline in oil prices how do you see a way out of the crisis? Saudi Arabia has developed a post-oil program and it will certainly succeed. In the UAE, we don’t only rely on oil but also on trade and other sectors. The UAE will always stand by Saudi Arabia, as well as Kuwait, Bahrain and Oman. I think that the GCC states are aware of the challenges and ready for the post-oil era. How strong is the hospitality sector in Dubai? The total of hotel rooms in Dubai is 100,000. Over the Eid holiday all the hotels were fully occupied. Our guests are from all over the world; different nationalities, religions and cultures. This is way the UAE works. It appeals to everyone. Do you think that Western nations are cooperating lately with Iran to target Gulf states particularly Saudi Arabia? Iran is more dangerous to the Arab world than Israel. I know that Israel is considered an enemy by the Arabs, but we know it and have a mutual understanding about it. Israel also knows its limits and does not cross them. However, Iran has a terrorist and expansionist plan. I have warned the GCC states about from Iraqi and Houthi Shiite militias in my articles for more than a decade. I have spilled too much ink on such warnings…We should grab the snake by its head and eradicate the threat before it spills over more border to our countries. We are fortunate to have the strength, the manpower and men of thought to tackle this risk. However, no country is safe from Iranian terrorism. Radicalism, murder and militias are stronger than most armies. Coexistence with Iran is impossible under the current circumstances. After the significant role Qatar played in promoting Hezbollah in 2006 through Al-Jazeera channel and other Qatari media, do you think that Doha has returned to the GCC fold or is it out of tune with the other Gulf States? Qatar cannot do without us, and we cannot do without it. We share territories. It is impossible that Qatar deviates from the agreed path. We are all one family and clan. As for the upcoming US election, you said that billions of dollars will be withdrawn from the US if Donald Trump wins the presidency. What are the reasons behind the GCC support for Hillary Clinton given her foreign policy errors in the Arab world, like in Libya? We know Hillary Clinton whereas we don’t know Donald Trump. He works for his own personal interests even if it means dealing with the worst evils in the world. He worked with the Russians, the arch-enemy of the US, and with China for personal ends. He is not a successful man. Unfortunately, the American voters who support Trump do not read much, and when they do, they don’t understand what they are reading. Clinton is much better because we know her and how she works. She has learned from her own mistakes, and I don’t think that she will repeat the mistakes of the past. I am a 100 per cent sure that she will be the better option.